When I arrived at the massive chain store across town, the parking lot was already an oily sea of minivans and pickups, SUVs and sedans, abandoned shopping carts and discarded seasonal red paper coffee cups. I had a sinking sensation as I stepped uneasily across that sunless sea. My faith in American capitalism was failing faster than the real estate market in LA. Nevertheless, I rode the swell through the automatic doors and waded with my squeaky cart through wave after crushing wave of bleary-eyed customers. I sloshed my way against the current toward the sale items that had lured me in. But when I saw the checkout lines stretching around the corner, down the aisle, and away toward the garden center, the sinking feeling left me; I had hit bottom. It's dark down there—Black even—despite all the fluorescent lights. With nowhere to go but up, I swam for fresh air, buoyed by my empty cart. No $3 pair of pajamas is worth drowning for. Gasping, and dripping, I fell back into the driver's seat of my car and pondered a bit. Defeated. That's how I felt. The native hue of resolution was sicklied o'er with the pale cast of thought. And doorbuster sales of great pith and moment with this regard their currents turned awry, and lost the name of action. To shop, or not to shop? That was definitely the question. 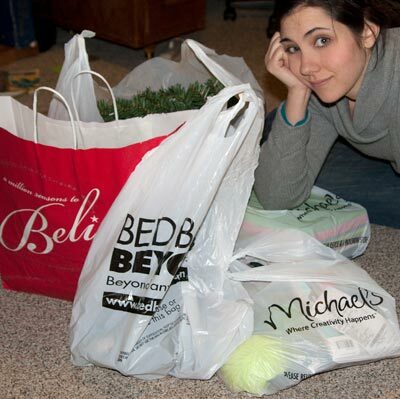 Whether 'twas nobler in the mind to suffer the slings and arrows of outrageous consumerism? Or to take arms against a sea of troubles, and by going home for coffee end them? I considered Christmas. I considered the potential savings on gifts. From the great height of the big-box store parking lot on the hill, I considered the yawning abyss of the mall down below. I considered the coupons stacked in my wallet. I considered the hordes of people crowding the stores in search of a bargain. Last year on this day, somebody somewhere was trampled to death in a shopping stampede. Was it worth the risk? Shouldn't I rather bear those ills I had than fly to others I knew not of? In the end, I resolved to take my life in my hands and descend to the Macy's parking lot. (Though this be madness, yet there is method in't.) The sun was beginning to rise, and the outlook appeared slightly less bleak as I plunged into the mall. I slid past crimson signs printed with swirly fonts saying "Yes" to Virginia. Perky clerks who'd been up since 4:00 A.M. wondered if I was "finding everything all right." Bing Crosby crooned somewhere over my head, trying to put me in the mood to spend. It must have worked. Bing, unlike me, knows what he's doing when he's at the mall on Black Friday. As I set sail for home through the fog, I brought with me bags full of stocking stuffers and craft projects and games and articles of clothing. I also brought back a much lighter purse and a much lighter head. (Ay, there's the rub.) It had taken me four hours to paddle through the mall. I stayed afloat, and yet, somehow, I still feel a bit soggy and defeated. I managed to avoid getting caught in the Black Friday undertow, but it may take me a few days to dry off and get the sand out of my hair. I'm no thrill seeker. I wasn't altogether ready to test my strength against the storm surge of bargain shoppers. The only surfing I'm comfortable with is the kind I can do from my computer desk, where I can dip my toes in the kiddie pool version of Christmas shopping. Going out on Black Friday was a true test of nerve. Although I snagged some great deals, I really don't think I will attempt it again. Well, not for another year, at least. The annual Christmas issue of Martha Stewart Living just arrived in my mailbox, its colorful bulk barely fitting through the slot. As always, the pages are filled with time-consuming creative projects that walk a fine line between kitsch and beauty. I love flipping through the glossy pages, filling my head with ideas for handmade decorations and show stopping desserts and thinking smugly to myself, "Yep. I could make that. Mm-hm. I could definitely do something jazzy with those!" Some of the cookies in this issue are almost pretty enough to dip in shellac and turn into family heirlooms. Martha. She's got tips on how to apply little candy snowflakes with a pair of craft tweezers. Craft tweezers. These recipes are sprinkled all over with nonpareils and faux bois. Their beautiful possibilities give the perfectionist in me a thrill. And who wouldn't love to present friends and neighbors with a plate of candy-coated perfection? 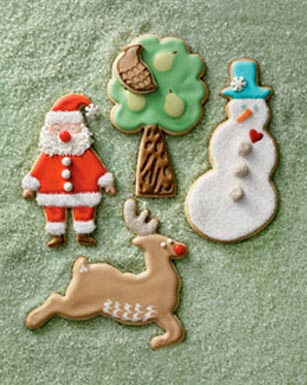 But here's the problem: Achieving the perfect Christmas cookie requires skill and patience. It requires time and quiet concentration. It requires an organized workspace and a steady hand. It requires conditions that are, quite frankly, not to be found in my kitchen. I would be shooing away greedy toddlers, with warnings not to handle, not to taste, not to touch. I shudder at the thought of chubby fingers pressing into my work of art before the royal icing had dried. And if I achieved the perfect cookie, what then? What would be its end? Confinement in a lighted glass case in a hushed gallery? No matter how many careful hours I spent on its aesthetic development, a cookie is still, after all, a cookie; all its yuletide perfection would be ground to mush between the teeth of unwashed plebeians like my children. Like me. How could we eat perfection? How could I think of doing so as anything but a waste? Martha. Her magazine is crammed with page after page of homemade potential. Issue after issue, I imagine all the great things I could be making—so many great things that I don't know how to begin. Clearly I do not own a sufficient supply of felting needles or snowflake-shaped paper punches or ultra-fine glitter. But I lack more than a room full of specialized craft tools. What I lack is a willingness to fail. Or to see all my work go to waste. I've been planning on making a dress. Or maybe a skirt. Planning may be too strong a word; I want to make one. For fifty cents, at the Saint Mary's Catholic Church rummage sale last year, I bought some fabric. It is so lovely—has so much promise—that I can't use it for just any old article of clothing. It's from Thailand. It's raw silk. It's the warm orangey-red color of oak leaves in fall. 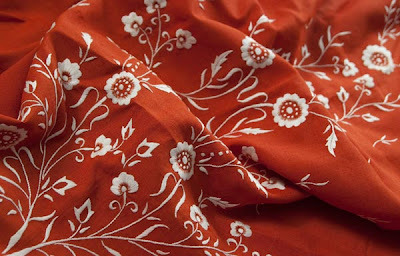 It's embroidered with gorgeous cream-colored vines and flowers. It is beautiful. This is why it has been waiting in a plastic bin under my bed for more than a year. I cannot bring myself to touch this fabric with a pair of scissors until I am certain that I am about to make it realize its full potential. If I were to make something merely acceptable out of this precious fabric, what a waste it would be! Or if I make the perfect skirt and then ruin it with spilled wine, how, again, could I think of it as anything but a waste? If we don't, how could we think of it as anything but a waste? If only I had realized my potential, I could have been a graphic designer to the stars. What a waste. I could have been a four-star chef. What a waste. I could have been an ivy league professor. What a waste. I could have been a first-chair violinist (if I had ever taken a lesson). What a waste. I could have been a published writer. What a waste. I could have sewn the perfect skirt or baked the perfect cookie. I could have been Martha Stewart. What a waste and a shame. It is a waste. Unless I have wasted my life for the sake of others. And if that is the case, then all that wasted potential is not a shame at all; it is a glory. It is costly perfume—perfume worth a year's wages—wages with the potential to do much good—poured out with love and with tears. A lifetime is not enough to pursue half of what I want to do. But a lifetime is not all I've been given. So I am free to waste my potential on my friends, my enemies, my neighbors, my husband, my children. My God. I am free to begin a sweater and never complete it. I am free to let muddy shoes run across the clean floor. I am free to be an amateur, free to burn the pie, free to press delete. I am free to spill glitter, to write wordy blog posts, to let little fingers smear the icing. I am free to let the wine spill over my perfect skirt. Free to eat perfection. Martha, Martha, you are anxious and troubled about many things, but one thing is necessary. Take, eat. Perfection is meant to be eaten. Take the cup. Wine is meant to be poured out. Christmas is coming. I will sew. I will bake cookies. I will raise a toast to one with all the potential in the universe, who "made himself nothing, taking the form of a servant, being born in the likeness of men." One of the best things about moving back to my home town is that my sons now attend school at my own alma mater. Because our town is small and my husband's job hours are somewhat flexible, we try to meet our boys every Friday at school to eat lunch as a family. It at first brought on a strong sense of dejà vu to be munching potato chips in the same room where I had spent so many lunch hours as a kid. Some of my own teachers are still there, patrolling the tables, conversing with students, and drinking half-pint cartons of milk. I can only imagine how many thousands of peanut butter sandwiches my old teachers have seen devoured in that room over the years. And after a couple of decades in the classroom, those teachers must have a hard time remembering our names, let alone the blurred succession of individual events that made up our lives during those years—events that stand out clearly in our own memories as momentous, even formative. So I was pleasantly surprised recently, on Saint Crispin's Day to be exact, when of my teachers from high school strolled up to me at the lunch table to chat about old times. He informed me that one of his current students had just come close to winning the "Hannah" award. I looked blank. He continued, "Yeah, the 'Hannah' award! For the best Saint Crispin's Day speech ever delivered in one of my classes." I raised my eyebrows. He added, "I still have my students recite that speech on this day every year, but your speech set the gold standard. This is the closest anyone's come yet to matching your presentation. All others pale in comparison." ...unless I did not, in fact, do the thing for which I am being congratulated. Memory is a mystery. How judges can determine guilt or innocence, based on the testimonies of witnesses that happen to be human, is also a mystery. Where were you on the night of November 5, 2009? A year from now, a month from now, maybe even on the morning of November 6, 2009, the recollection might be hazy. It will certainly be biased. It may even be gone. As a mother, I am asked at various times each day to be judge (or jury or prosecutor or sometimes defendant.) But discerning what happened, even when I'm the one who did it ("Did I really say you could have another piece of candy?") is not easy. When one child lies howling on the floor, one child stands pointing a finger, and one child talks incoherently at the ceiling, piecing together the truth of what took place can seem impossible. Each child recalls the incident differently; each saw the moment from a unique angle, and each has interpreted the event in the light that shines most favorably upon himself. The memories of all three are suspect. I may not be wearing a black robe, but I preside over these little court cases everyday. Maybe I should ask my kids to address me as Your Honor. "Honor thy father and thy mother" has connotations I never considered before becoming a parent. I want a gavel for Christmas. If young children, with steel-trap memories, cannot be trusted as reliable witnesses, how can we grownups, with our multiple commitments and distractions and our longer lives, hope to get the details of our stories right? My husband read one of my blog posts from last month, and commented that I had left out some important details. But, I maintain, those details were not so important. Forgettable, really. I am sure I will forget them. And then we will wonder someday, as we recount the circumstances to one another, whether we are speaking about the same incident at all. Of course I understand that not all memories can be so haphazardly kept; some truths must never, at the peril of body and soul, be forgotten. And some truths must not, at the peril of soul, be remembered. But all those truths and fictions in between are, as far as I can tell, a collection to cherish and bequeath, or a heap to relinquish and neglect, at will. As a parent I often wonder into which category my children will stash the events of their own lives. My husband has carried on an agreeable disagreement with his brother for many, many years now. The question is: Whose bike was it? What happened to the bike and how is another story. But the laughable argument arises at family holidays, when each man adamantly maintains that it happened to his bike. My brother and I also grew up in the same house. But at times, you'd never know it. I realize now that my parents had little control over what experiences we would carry with us. We lived in Warsaw for a bit when I was 13, and what stands out in memory is not what adults might expect. We visited some palaces and walked through some Polish museums. But those memories are cloudy. What I recall clearly is playing with Legos on the floor, next to the funky couch that folded out into a bed but wasn't a futon. And unfiltered coffee with grounds clogging the bottom of the cup. And the pastry we thought contained chocolate filling but turned out to be packed with a solid layer of poppyseeds. And I remember the day the Pepsi bottle smashed on the slushy train tracks, when the meat fell in the mud puddle, and Mom came home and cried. Many of my brother's childhood memories are probably the same. But I know that some are more different than I would have expected. We knew the same people. We took the same vacations. We went to the same school. I think. I was there. Or so I remember. My teacher, I am certain, was there as well. He was an eye witness. 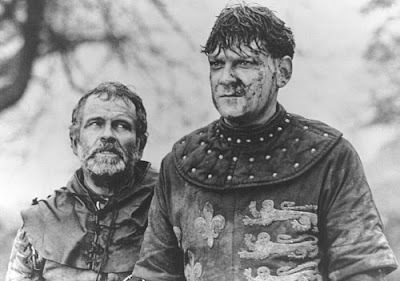 And he remembered my Saint Crispin's Day speech to be the best ever delivered on the lunch room stage. But I do not recall it. I am certain I did not do it. I never memorized any portion of Henry V. I wish I had. Against my teacher's repeated protestations that it was me, I maintained that I had no memory of that day. I would like to be remembered well. Of course I would. But only for what I have actually done. A few days later, my teacher found me again to inform me that he had, indeed, made a mistake. He had replaced another girl's face with mine, because he had been talking, with another of my old teachers, about a thesis paper I had written on "Bad Words." I do remember doing that. But some other girl had made the gold-standard Saint Crispin's Day speech. And she will be remembered for it. And I have a feeling that I will remember this amusing mix-up whenever I hear the Saint Crispin's Day speech in years to come. Some things are worth committing to memory.